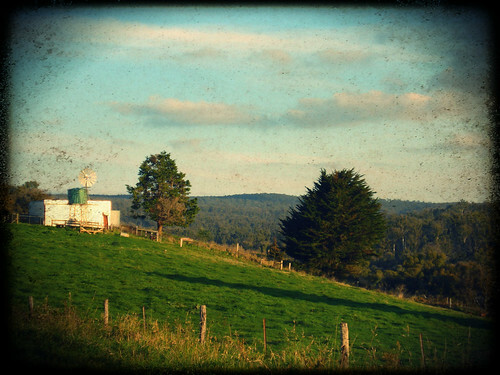 We took Friday off last week and headed up to Daylesford for the weekend. It was lovely to get away, despite the (very) cold weather. We took lots of walks, ate a LOT of good food and saw lots of lovely scenery. The most divine smell greeted us as we walked through the doors into the shop. 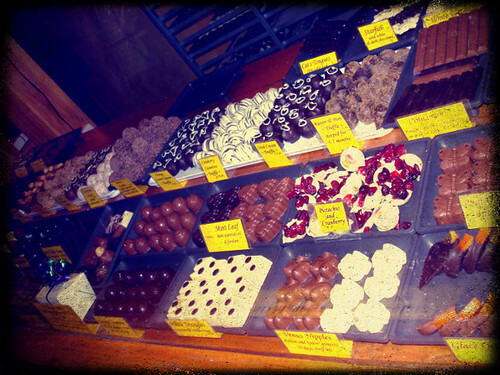 You can also see the chocolate being made through a window, and they do demonstrations at 11am and 2pm daily. They have only ever used fair trade, Callebaut Belgian chocolate and oh, my. It was divine. I highly recommend the peanut cups and the nougat parcels. There was a vat that held 30kg of tempering milk chocolate in the kitchen, and to say I wanted to swan dive into it would be an understatement. We went for a meandering drive and ended up here at about 4.30pm just as the sun started to get low in the sky. 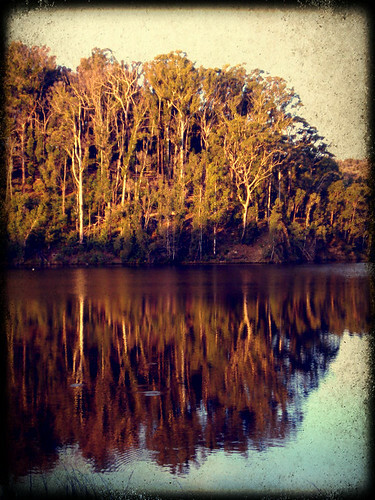 It was a brilliantly sunny day there (MELBOURNE: TAKE NOTE) and the light and the reflection of the trees on the water was beautifully golden. We also ate at some really, really lovely restaurants and cafes - I highly recommend Kazuki (Japanese/Australian fusion), Ego's Culineria, Frangos & Frangos restaurant and Wombat Hill House Cafe, just to name a few. I ate the greatest toasted sandwich of my life at the Wombat Hill House Cafe - slow roasted lamb on brown bread with dijon mustard and tomato relish. It. Was. Divine. It makes my soul soar to know that, somewhere in Australia, a chocolate company has embraced peanut butter. Hannah, it's more like chocolate with a peanut in it rather than peanut butter, but it's still delicious! And not in that sickly sweet American way, either - just a nice, subtle nut flavour. isn't the smell of a chocolate shop intoxicating! Leah, it was divine. And so inviting. I just wanted to buy samples of everything to try! Lucky I've never been there - sighting a vat of chocolate would have me acting like Augustus Gloop out of Willy Wonka ha ha. Sounds like a magical trip. Keely, it was the most tempting thing I've ever seen! I really needed a big spoon to start shoveling it into my mouth. Anna, it's a really lovely country town outside of Melbourne. Yes, the chocolate mill is definitely worth an extended visit!